In der Installation von Ursula Biemann & Paulo Tavares geht es um die Kosmo-Politik in Amazonien, wobei die Natur als Subjekt mit eigenen Rechten erscheint. 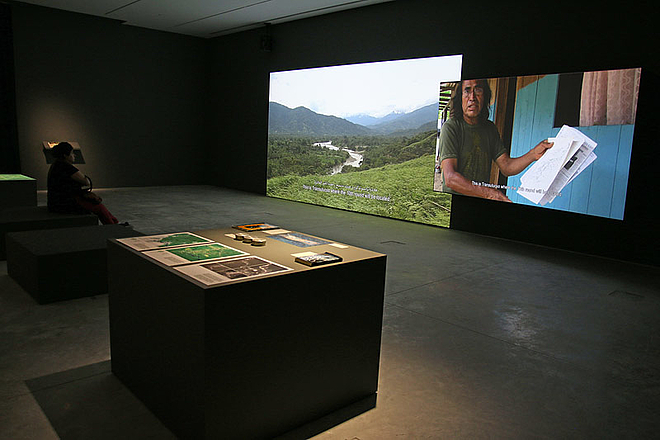 This project navigates across a frontier landscape—the living forests of western Amazonia. Situated at the transition between the Amazon floodplains and the Andean mountains, this border zone is one of the most biodiverse regions on Earth and fulfills vital functions in global climate regulation. It is also the home of indigenous nations and a land of great ethno-cultural diversity. Underlying this vast territory are immense deposits of oil, gas, and minerals, most of which remain untapped to this day. Recent years have seen the expansion of large-scale extraction activities in western Amazonia, driven by escalating competition between states and multinational corporations over the control of these strategic natural resources. Forest Law enters in conversation with parts of the tropical forest that are zoned for this sort of impact following a series of landmark legal battles that are unfolding in the Ecuadorian Amazon, where nature has been declared a subject of rights. The project takes a slow road in mapping the historical, political, and ecological dimensions of these trials on behalf of the forest and the people who cultivate the forest, tracing the entanglements and frictions between the ethical and epistemic stakes these conflicts raise. Invoking global climate destabilization, loss of biodiversity, and toxic pollution, disputes over the forest lands of Amazonia are located simultaneously within and beyond the region’s immediate geography. Deeply rooted in local histories of violence and dispossession as well as within a broader terrain of struggles, these conflicts reflect a global, universalist, cosmo-politics. Forest Law dwells within this territory. The project emerges from dialogues—between us and our practices, the camera and the forest, and, most importantly, ourselves and the many people whom we encountered while traveling through Amazonia in November 2013. Video interviews are joined by archival materials, legal documents, and cartographic analysis, reassembled into a complex mosaic-landscape that integrates multiple perspectives and works across different temporal and spatial scales. Speculative and essayistic, and informed by multiple disciplines, this multimedia composition attempts to forge ties that bridge, disrupt, and slip through the partitions that define our systems of knowledge and the modes by which we perceive, represent, and relate to the world of which we are part. Among the many interlocutors of Forest Law, a constant partner was Michel Serres’s book The Natural Contract. Serres, in his own essayistic way, provides us with a frame, both philosophical and methodological, for our engagement with a territory that refuses to be represented by a single, hegemonic perspective. The first lines of this plurinational and multispecies contract are being currently drawn in Ecuador. Forest Law reflects upon this new constitutional space wherein both humans and nonhumans gather in a political assembly, the living forests of Amazonia. Earth, waters, and climate, the mute world, the voiceless things once placed as a decor surrounding the usual spectacles, all those things that never interested anyone, from now on thrust themselves brutally and without warning into our schemes and maneuvers. They burst in on our culture, which had never formed anything but a local, vague, and cosmetic idea of them: nature. What was once local—this river, that swamp—is now global: Planet Earth. 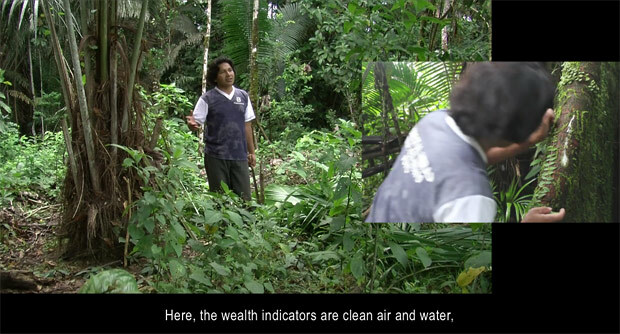 Ursula Biemann is an artist, researcher, and video essayist based in Zurich. Biemann’s work is invested in exploring the uneven resource distribution, climate change, and ecologies of oil and water as principles of planetary organization of power. Paulo Tavares is an architect and urbanist whose work deals with the visual and spatial politics of territorial conflicts and climate change in the Amazon and other frontiers across the third world. Tavares is based in Quito.